This week, a developing field of research that combines astronomical techniques with the study of ancient man-made features and the surrounding landscapes will be highlighted at the National Astronomy Meeting (NAM) 2014 in Portsmouth. From the ‘Crystal Pathway’ that connects stone circles on Cornwall’s Bodmin Moor to star-aligned megaliths in central Portugal, archaeo-astronomers are discovering new evidence that Neolithic and Bronze Age people were acute observers of the Sun, Moon and stars and that within their local landscape they managed to insert astronomical references. Silva’s investigations of European megaliths concentrate on 6000-year-old winter occupation sites and megalithic structures in the Mondego Valley in central Portugal. He has been able to discover that the entrance corridors of all passage graves in a given necropolisare aligned with seasonal rising over nearby mountains of the star of Aldebaran, the brightest star of Taurus. The connection between the appearance of the star in the springtime and the mountains where the dolmen builders spent their summers has echoes in local folklore about how the Serra de Estrela or ‘Mountain of the Range Star’ established its name from a Mondego Valley shepherd and his dog following a star. Pamela Armstrong, from the University of Wales Trinity St David, integrates the idea of skyscapes in her research on the finest stone chambered tombs in Britain, which are located in the north Cotswolds. 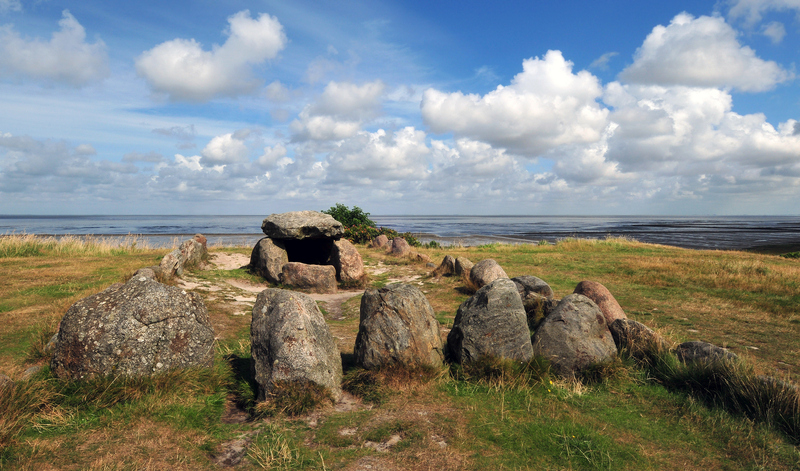 Neolithic people are known to have buried their deceased in these earthen mounds, but it has been considered that they possibly also placed their tombs towards significant points of lunar, solar, and stellar rise and set on their local horizons. Pamela’s work explores whether these Neolithic settlers practiced a different type of astronomy to that of the Mesolithic hunter-gatherers who were their predecessors on this landscape. In addition to this, Brian Sheen and Gary Cutts of the Roseland Observatory have worked alongside Jacky Nowakowski, from Cornwall Council’s Historic Environment Service, to investigate the important Bronze Age astro-landscape extending over several square-miles on Bodmin Moor, Cornwall. At the centre lies Britain’s only triple stone circles, The Hurlers, of which two are connected by the 4000-year-old granite pavement, named the Crystal Pathway. The team has confirmed that the inhabitants during the Bronze Age used a calendar that was controlled by the Sun. The four cardinal points are marked together with the solstices and equinoxes. Additional researchers who a presenting in the session are Liz Henty from the University of Wales Trinity St David, reporting on Tomnaverie Recumbent Stone Circle in Scotland and Dr Frank Pendergast from Dublin Institute of Technology, discussing findings on a passage tomb at Knockroe in County Kilkenny, Ireland. Prof Richard Bower of ICC/IMMEMS Durham University will also be presenting computer models of a universe based on a 13th century text written by Robert Grosseteste, Bishop of Lincoln, and will illustrate how it links to today’s concept of multiple universes.